Donating a car may or may not save you tax dollars. If you donate a car to a qualified nonprofit organization, you may write off its value on your federal income tax return. The value of your write-off is equal to the value of your car, as determined by Internal Revenue Service valuation rules. 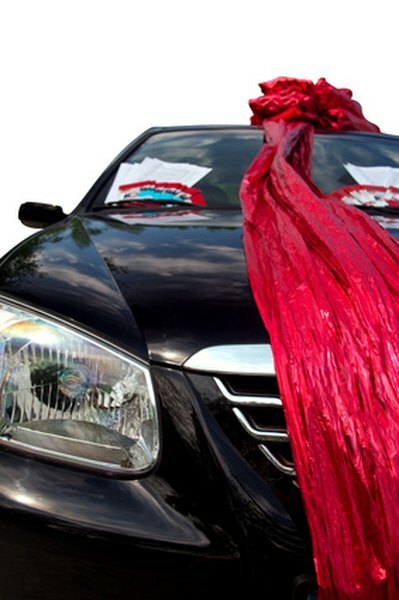 If you donate your car to any party other than a qualified nonprofit organization, however, you enjoy no tax benefits and you may even subject yourself to gift tax liability. The value of your donation is only deductible if you give your car to an organization qualified under Section 501c3 of the Internal Revenue Code. Most nonprofit hospitals, universities, public charities, scientific research organizations and churches qualify. Normally, however, the organization must apply to the IRS for approval and receive a positive IRS Determination Letter before donations are tax-deductible. The Internal Revenue Code carves out a special exception for churches -- they don't need to apply for 501c3 status or receive a positive Determination Letter before donors can write off the value of their donations. The IRS is entitled to retroactively revoke a church's preferential tax status, however, if it engages in certain activities such as operating on a for-profit basis or engaging in substantial political lobbying. For this reason, many churches have obtained Determination Letters from the IRS. By donating to approved churches, you don't risk retroactive withdrawal of your deduction. The value of your deduction is equal to the fair market value of your car. The IRS suggests that you value your car using a used car sales guide that is designed to help sellers price cars for sale to private parties. You must take into account its make, model, year, condition, warranties and add-ons and the location of the sale. If your car is worth more than $5,000, you must have it appraised by a qualified appraiser to take the deduction, and you can't use an appraiser affiliated with the recipient. You must itemize your deductions to write off a charitable donation on your tax return, meaning that you can't take the standard deduction. This will only result in a net tax benefit if the total of your itemized deductions exceeds the value of your standard deduction. You must list your deduction on Form 1040, and you must also complete Schedule A, an appendix to Form 1040 that allows you to list your itemized deductions. If the total of all of your non-cash contributions for the tax year exceeds $500, you must also complete Form 8283, which requires you to provide details of your donation.